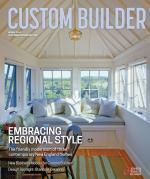 Shouldn’t the custom home builder get the added value of a project for being, well, the custom home builder? Rod Cullum would just smile when he’d hear a fellow builder brag that a client cleared half a million dollars selling the house the builder had built for them a couple of years prior. The price appreciation was a sort of trophy validation for that builder’s product. But if that builder was a typical cost-plus builder with 10 percent markup on, say, a $1 million house where the lot cost $300,000 and construction cost $700,000, that builder perhaps reaped about $70,000 in gross margin. The net return could be much less than that if the builder didn’t factor in enough for overhead, warranty, and other costs that pulled money from his pocket. Meanwhile, the real estate agent who sold that house for the owners probably earned as much from the commission alone. Like Cullum, builder Justin Bauer was doing custom work. His company, Clarity Construction, in the Des Moines, Iowa, metro area, was building one-of-a-kind homes, but in a manner that he felt left too much control of the margin to the whims of subcontractors’ bids and the disposition of the client. Both builders have since aimed to taken more control of their companies’ future growth and profitability with business models that break from the custom-building norm of providing buyers whatever they want. Only a few short years after starting his company in 1985, Rod Cullum reached the conclusion that the home building industry was broken. He began as a custom home builder, but when the savings and loan crisis hit, he switched to production home building for a brief stint. For a fee, he took over half-built subdivisions from the thrifts, built out those communities, and managed the models and sales. Three years later, he returned to building custom homes and brought with him a production construction mentality. That perspective opened him to the possibility that there had to be a better way to run a business than the usual dance of waiting for the phone to ring, drawing a house for prospective clients, proposing a budget, and then trying to convince homeowners to pick you to be their builder. If the homeowner did select you, you’d then be in a race to the bottom on cost, soliciting bids from multiple subcontractors and then beating down each one to cut their price. One lesson Cullum learned on the way to reinventing Cullum Homes was that if you own the land, you own the deal. When clients owned the lot, they could dictate the layout, pick the architect, and bid out the design to other builders. But when Cullum owned or controlled the lots, he could build his home with plans that were suited to the property, he could pick the architect, and clients would have to choose him as the builder if they wanted to build on that land. Cullum set out to ask his trades how they price a job. Do they make money at that price? How do they figure out their cost for materials? Did they figure in a margin with their bids or were they cost-plus contractors? Some of his trade partners, after doing the math, realized they were merely clearing a wage on their jobs. The Cullum Homes staff in 1995 consisted of Rod, his wife, Kim, an architect, and an office clerk. The process of compiling, for example, the square footage cost of building materials such as concrete, stucco, and tile, and then combining these figures with the trade partners’ pre-negotiated charges for labor, waste factor, and overhead was an enormous task. It took Cullum about three years to complete, but he built the database to a point that enabled him to execute another pillar of his business model that would distinguish him from the traditional way custom home builders market their product: He works backward. Yet another pillar of Cullum’s business model is one that relieves the pressure to advertise and get your brand out in the market so the phone will ring. Here, the builder of unique custom homes uses fully furnished models. 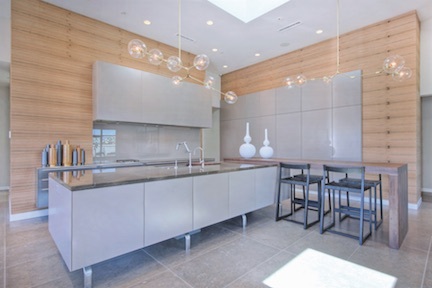 Situated between Camelback and Mummy mountains is The Village at Mountain Shadows, a 10-acre community of 40 one- and two-story residences designed by architectural firm Candelaria Design Associates, in Scottsdale, and being built by Cullum Homes. Two model homes stand on the north end and visitors can see the homes’ unique offerings, such as Trutankless water heaters, Daikin air conditioning, and basement space with the flexibility to add a game room, wine cellar, additional bedrooms, or even a car bar—a wall-to-wall glassed area where automobile enthusiasts can show off their collection thanks to a motorized lift that moves cars between the ground-level garage and basement showroom. Cullum says clients like to touch and feel product so they know what they’re buying and how they’re buying it. 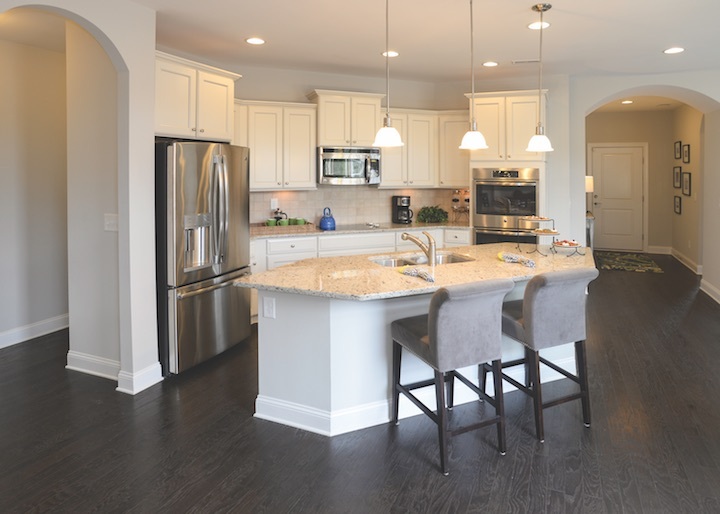 “We have that model home so we can get nose-to-nose and toe-to-toe with customers because once they touch our product and get to know us, our likelihood of being their builder is very high,” Cullum says. Most of the time, the selling price of Cullum’s homes comes in near what the clients budgeted, bar any change orders. Cullum rarely deals with cost variances because his unitized pricing system provides consistent, accurate building costs. The builder buys most materials direct and meets with trades every six months or so to review and revise pricing and pre-negotiate figures for the next cycle. Regarding profit, Cullum says his margins are in the top echelon for what the National Association of Home Builders recommends custom home builders should be realizing, which is between 25 to 30 percent gross margin. Today, Cullum Homes has 55 employees and annually builds about 20 ultra-luxurious million-dollar homes either on lots it owns or on a handful of spot lots. The builder is starting a 33-lot project in Desert Mountain, almost 30 miles from Scottsdale—too far for Cullum’s subs based in Scottsdale. 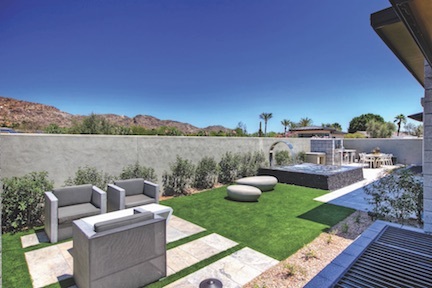 Cullum’s son, Brad—Cullum Homes’ COO—is charged with developing relationships with trades in the Desert Mountain market and implementing the system of unitized, pre-negotiated pricing. Justin Bauer had been building custom homes­ in Des Moines, Iowa, long before he started his custom home company, Clarity Construction, in 2008. It was a good business. He finished a handful of high-end houses each year and some sold for as much as $3 million. Then Bauer heard a Pew Research Center statistic that grabbed his attention: Every day since January 2010 there have been 10,000 Baby Boomers who turned 65 and retired, and an additional 10,000 more will reach their 65th birthday every day until the year 2030. By then, 18 percent of the nation’s population will be at least that age compared with 13 percent in 2010. According to figures released during mid-2017 by John Burns Real Estate Consulting, more than 60 percent of people shopping for a home are older than 55. That’s 62 million households with a net worth of $488 million. Bauer decided that, to fuel future growth, he should focus on product for 55-plus buyers. He had every intention of using his own floor plans and executing his own marketing strategy, since he’s been building and selling since 2001 and knows what he’s doing. But as Bauer expressed his interest in catering to this demographic, an industry acquaintance suggested he check out Epcon Communities Franchising. Bauer was skeptical but did his due diligence by talking to builders who were Epcon franchisees. They reported a good experience, so Bauer eventually traveled to Epcon’s Columbus, Ohio, headquarters to meet Epcon founders Edward Bacome, CEO, and Philip Fankhauser, president. No. 26 of the largest private builders. Another appeal of the Epcon approach for custom builders is they don’t have to kill their brand, Buckman says. They can keep their company name and continue constructing custom homes if they want. In many instances, becoming a franchisee and implementing processes and systems in their operations has enabled custom home builders to diversify and scale up their volume, which would have been difficult with their previous business model. For many franchisees, building Epcon communities became the principal part of their business because the construction cycle is more efficient and homebuyers can go from contract signing to move-in in as little as 90 days. Epcon’s recommended criteria for franchisee applicants is that they can secure a construction line of credit of at least $5 million and have a minimum of $500,000 in liquid capital and a net worth of $1.5 mil­lion. Ideal applicants need not have a home building background, but experience in a small business and dealing with profit and loss management is a plus. The vetting process also includes a face-to-face meeting with Epcon managers to confirm that the applicant’s goals and objectives align with Epcon’s mission for delivering quality to customers, of valuing employees, and sharing a belief in training. Franchisees pay an initial $50,000 fee. Other ongoing charges include a monthly franchise fee, a monthly marketing program fee, and a 1.75 percent project royalty fee on the purchase price of the home with each closing. That percentage declines as the franchisee sells more homes. Unlike franchise contracts in other sectors such as restaurants, which can last for years or even decades, the Epcon franchise ends when the builder’s development is sold out. Then the builder can ante up for another franchise to develop another community. Market intelligence is among the benefits that stand out for Bauer. Epcon has deep knowledge about mature-buyer demographics, psychographics, and metrics from decades of experience and research on the efficacy of posting signage near your property, online targeting, geofencing, and advertising in traditional media. The sales and marketing toolbox also includes resources such as a sales center presentation gallery, virtual tour software, and access to training from nationally recognized sales experts such as Jeff Shore. 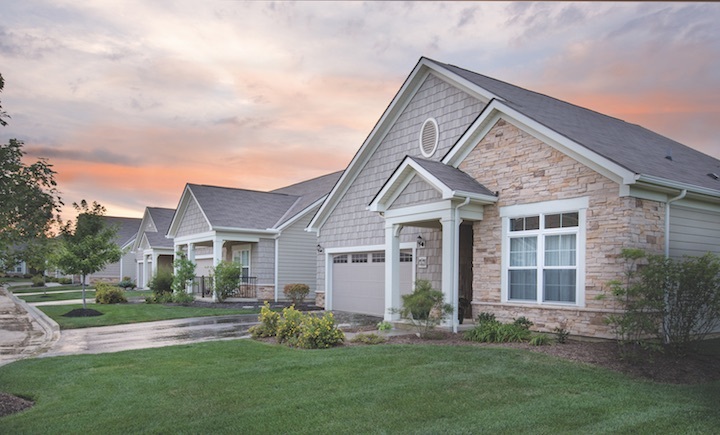 Bauer’s company Midwest Development Partners, which uses the Epcon franchise model, broke ground on its first community in Ankeny, Iowa, in fall 2015. Bauer has since sold 33 houses in the 83-lot development and 25 owners have moved in. He also started a 93-lot development in nearby Clive and presold four units there. “It’s just a better business model for me,” he says. “I get to make money off the development side and the building side. I even hired my own employees instead of hiring Realtors, and we do the list side ourselves. I’m making as much on these homes as I did on some of my much bigger custom homes. You know what your margins are and have better control because you’re building units over and over again. You’re centrally located instead of driving all over to build custom. It’s a great business model for us.” For now, Bauer says he’ll build a custom home if one falls in his lap, but his primary goal is to build 1,000 homes around Des Moines targeting 55-plus buyers during the next 10 to 15 years. Comments on: "Custom Builders Branching Out"